Wow! I can’t believe I’m up earlier enough to actually get this posted! I’m about to head out to be a vendor at the 2010 Poynette Historic Home and Garden Tour/Arts and Craft Fair. If you want to go on the tour – the tickets are only $7.00. It features gardens, historic homes and a self-guided walk through one of Goose Pond’s premier prairies. 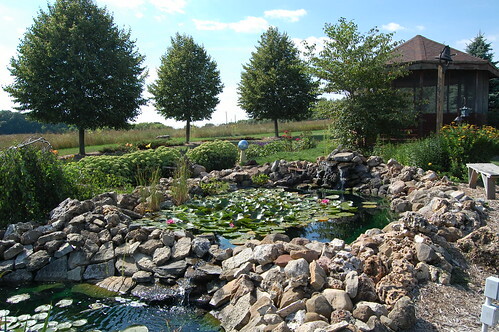 Above is a picture of one of the gardens on the 2008 tour. It is free to attend the Arts & Crafts Portion of the day. This is where I’ll be with many of my items you’ve seen me post about – jewelry, quilts, patchwork belts, owls and paper dolls on the go! Lunch is also available for purchase from the VFW/American Legion from 11am-2pm. Lunchtime music will be provided by members of the bluegrass band Moldy Jam & Gray Cats! Hope to see you at the fair!